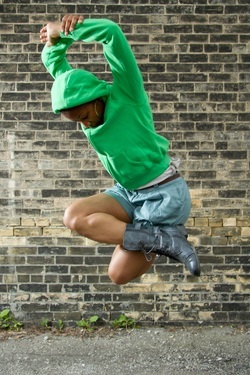 She founded her company Jasmyn Fyffe Dance in Sept 2007 “Some of the best dancers in Toronto”(Fashion Studio 7- Al Mon) and they have produced two successful season shows with Dance Works CoWorks in 2010 and 2012. In addition, Fyffe has been on the jury for the Ontario Arts Council Dance Initiatives Program, Dora Mavor Awards in the dance division and for the Dance Matters Series: From the Frying Pan. She is the recipient of three travel grants from the Canada Council for the Arts, the Access and Career Development Grant from the Ontario Arts Council, and her company has received one creation and three production grants from the Toronto and Ontario Arts Council’s. Fyffe has been commissioned by Pivotal Motion Dance Theatre, Wish Opera, Cawthra Park Secondary School, Agincourt Pentecostal Church, Cathedral Productions, Obsidian Theatre, Dramatic Change Youth Theatre, Oakwood Collegiate Institute and Copper Coin Arts Association to name a few. One of her most recent commissions “Pulse” was described as having “all the elements of a Broadway hit musical.” (audience member Omar Al-Salmadi). Her most recent commission was Ballet Jorgen’s solo’s and duets choreographic exchange and Earl Haig Secondary School (Claude Watson). In addition to this, she has created 11 dance works on her company and has co-created four works with other local choreographers throughout the span of her career. She has presented work in “Into the Roots. . .Beyond the Leaves” Sponsored by TD Bank in collaboration with Vivine Scarlett (2011), “Warfare” a DanceWorks CoWorks Series Event (2010), Guelph Contemporary Dance Festival (2009), Irie Music Dance Festival (2009 & 2011), Project Dance Toronto (2009), Bazaar (2010-2012), Dance Ontario DanceWeekend (2011), Choreographer’s Ball (2011) and Fresh Blood 2009 and 2010 (The Chimera Project); her solo “Indentity” presented in the 2010 showcase, got her an honorable mention by Artistic Director Malgorzata Nowacka. As an independent dancer, Jasmyn has performed in the touring musical UMOJA and has danced for Grammy Award winning artist Nelly Furtado. In addition she has worked with: Hanna Kiel, Red Sky Performance, Artists in Motion, Dance Migration, Scott Fordham, KasheDance, Calu Entertainments, Linda Garneau and international musical sensation Kirk Franklin. In addition, in the summer of 2011 Fyffe performed in two fringe festival shows (Catalyst and Jasmine Graham), the Dance made in Canada Festival, and the Labspace art installation “In-Memory.’ She has also travelled to Japan, NYC and Seattle, WA touring with a ‘Pop Idols’ show for the Booking House Agency. In 2012, Jasmyn was nominated for the first ever Young Center Dance Awards, she sits on the faculty for the Toronto Pre-professional Scholarship Dance Program (Lindsay Ritter) and was delighted to be a guest choreographer and Mentor for Dare to Dance 2012 and proudly had the opportunity to dance in Washington, D.C. at an inaugural event. One of Fyffe's 2012 works 'Pulse', was selected to be presented in the 2013 Montreal Fringe Festival and was quite successfully remounted. She received the 2013 Frankie Award for Most Outstanding Choreographer/Choreography in the festival. In 2013 Ms. Fyffe also co-choreographed and co-produced the highly acclaimed dance-theatre production, “Gimme One Riddim” with fellow choreographer Natasha Powell and remounted the show in Spring 2014 as it was selected to be a part of Harbourfront's acclaimed NextSteps Series and again at Flato Markham Theatre in the Fall. “Fyffe is an indisputably talented performer and dancemaker,” Kathleen Smith, The Dance Current Magazine.